Fit is everything in menswear. OK, there are other considerations when it comes to your Lean Wardrobe, too. Things like fabric quality, seasonality, color, formality – but fit is absolutely critical. That’s what this series – The Perfect Fit – hones in on. We’ve already gone over how a blazer should fit. And we’ve covered other formal staples, like how your dress shirt should fit. But as we get into the colder months, it’s time to shop for winter style essentials. You can rest easy knowing that there’s a stylish men’s jacket to help you top it all off – the topcoat. Grab one before you head out the door and your cold-weather outerwear game will be set. Let’s get into how a topcoat should fit, ehh? How Should My Topcoat Fit? The topcoat is a statement-making piece of classic menswear that belongs in your outerwear rotation. It’s right up there with rugged pieces like a modern field jacket. It’s just as important to pay attention to the fit of your outerwear as it is to dial in the fit of your dress shirts. Think of the topcoat like an extension of your dress shirt or sweater. In terms of how a topcoat should fit, similar sizing principles apply. You want a fit that’s nicely tailored, but with room to move. Look for armholes and sleeves that are tailored, but with enough room to slide the topcoat on over a blazer, suit coat, or sweater. That might mean sizing up, but it’s all up to you. 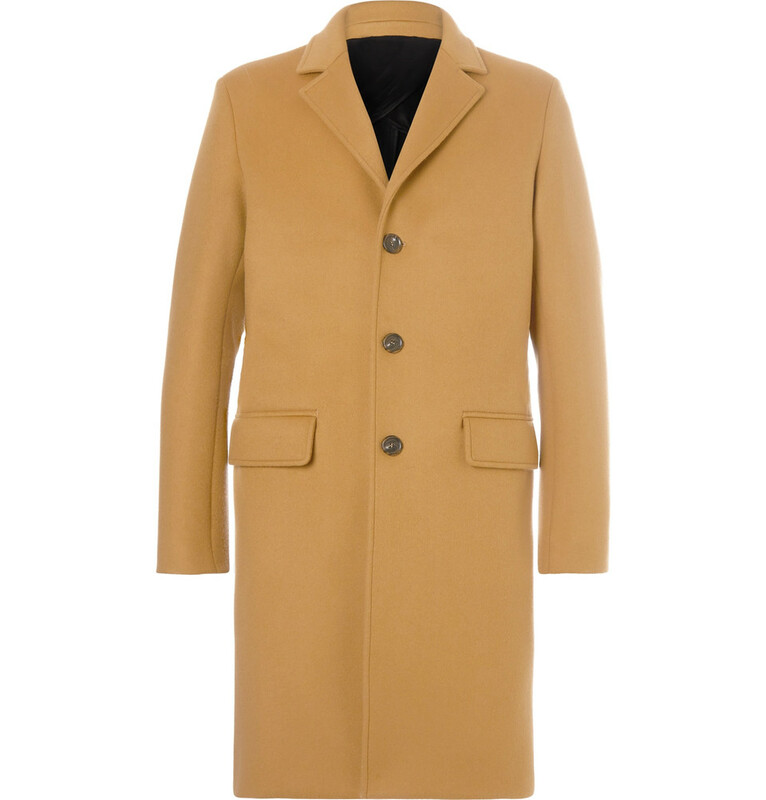 Length is important too – ideally, topcoats hit about mid-thigh. Although, the handsome and luxurious Italian Wool Boucle Glen Plaid Topcoat from Todd Snyder is a beautiful number that hits at the knee. Regardless, fit through the chest and shoulders is still crucial, folks. Like a good suit jacket, you want a piece that’s clean and well-fitting, but not skintight. It should hug the shoulders without suffocating you. Take our man Daniel Craig, for instance. He’s a heck of a lot more built than this menswear writer, but the fit principles he displays are on-point. Pay close attention to the buttons on the front of your topcoat. The middle button, when buttoned, shouldn’t be about to pop off. Nor should the front of the jacket be too baggy (kind of like when you’d put on your dad’s jacket as a kid). Remember, that jacket needs to button easily over a suit jacket, sweater, or chambray shirt in equal measure. The Bonobos Stretch Italian Wool Topcoat is a suitably tailored option that even offers a bit of give, thanks to the wool-elastane blend. Another solid option that makes it easier to dial in the fit? J. Crew, which makes its topcoats with precise suit sizing. Again, keep in mind that you’ll be layering your topcoat and size up as needed. In this case, the sizing system is certainly helpful. There are plenty of poor-fitting pitfalls when it comes to how a topcoat should fit, but first let’s review some essentials to keep in mind. Ahh, the many pitfalls of menswear shopping. Chief among them, for the purposes of this post? Buying an ill-fitting or poorly made topcoat. We always stress quality here at Effortless Gent, and that’s especially crucial when it comes to what’s protecting you from the elements. A beautifully made topcoat is the type of garment that gets taken care of and can be proudly passed down. The same can’t be said for a topcoat made with cheap materials from any of the more notorious fast-fashion brands. Avoid jackets made cheaply, poorly, or both. Look out for fabric that has a crunchy feeling from synthetic materials. Beware of a topcoat that hangs off your frame. If the shoulders of the coat are much wider than your own shoulders, that topcoat is too big, my friend. And a topcoat that’s too big in a crucial area like the shoulders often features excess fabric through the sleeves and the body – also a big-time no-no. Just like we mentioned in how a blazer should fit, you also want to stay away from an overly tight topcoat. If the seams threaten to split when the jacket is layered over a suit coat, that’s one to put back on the shelf. In most menswear staples, fashions are starting to shift toward a looser aesthetic. And yet, some things should still be tailored and sharp … like your topcoat! If you’ve got a larger frame, brands like J. Crew have you covered. Their Crosby Topcoat is made for a more athletic build. It’s tailored and well-fitting, but not too tight. There’s a happy medium for everything, especially for how a topcoat should fit. So, we’ve got the behind-the-scenes work out of the way – now, onto the fun part! You’re going to want to pull out all the stops when it comes to wearing your stylish topcoat. Like the chambray shirt or the classic tweed blazer, there are items that can be dressed up or down in plenty of different ways. The topcoat, of course, is one of those. It’s a reliable piece that instantly elevates any outfit – even something as simple as a grey crewneck sweater and classic blue denim. It’s absolutely wearable in situations both casual and formal. Look no further than a modern-day style icon, Mr. David Beckham, who does a positively stellar job of turning the topcoat into an everyday move with a grey crewneck sweater and classic brown work boots. Yet, Mr. Beckham also pairs that topcoat with tailored trousers and slick dress shoes – you should certainly feel free to do the same. Your topcoat might look best with your other favorite style staples, be they a pair of classic leather sneakers, burgundy corduroys and a henley, or something a little more formal and office-ready. The great part about cold-weather layering is that using a strong silhouette – like the topcoat – can really pull an outfit together. For one final look at how it’s done, Mr. Daniel Craig takes a classic V-neck sweater, dark blue denim, and stylish wingtip boots out for a spin underneath a slim topcoat. With a great topcoat, you can mix and match casual and dressy pieces for 007 style on a decidedly not-007 budget (particularly with a brand like J. Crew). Outerwear can be an intimidating area to explore, especially with so many different styles (and style situations). But looking for quality and a great fit will start your journey off on the right foot. A tailored topcoat that allows room for layering lets you mix and match your outfit from there. That topcoat will go with all the menswear pieces you know and love, from suiting to crewneck sweaters. And trusted menswear retailers, from the more luxe (like Todd Snyder) to the more accessible (like Uniqlo) can help you find the style you need. Pinpoint your perfect fit and finish off your search with a high-quality purchase. You’ll get a reliable piece of cold-weather outerwear that works all season long. What’s your take on the topcoat as an outerwear essential, and how would you wear yours? Images courtesy of The Fashionisto, Bonobos, GQ, Just Jared, and J Crew.